The last Sunday of the month and of this year means, it's time for the Koh Samui, Thailand weekly weather update; 25th December –31st December, 2017. My last long run of the year is in the bag and the weather conditions are about to improve. Running is great in the current cool conditions. Later today we may have one last time a strong wind surging over the island but after that the wind is about to disappear. This should make all boat operators around the island, since earlier this week many days all boat trips were cancelled due to the strong wind. 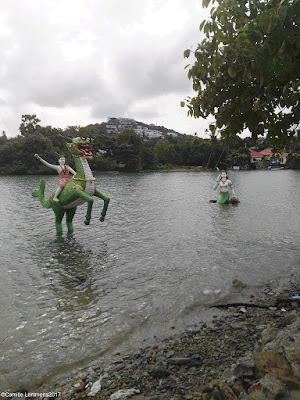 Koh Samui, Thailand weekly weather update; 25th December –31st December, 2017; High tide at some of the statues at Big Buddha. Last week saw a wet and windy week. Almost every day saw rain and sometimes hard rain with some thunderstorms as well. There were very short lived flash floods but in general the roads held out just fine. Yesterday saw no rain at all, except for a little drizzle around 6.30pm for a short while. Maximum temperatures ranged between 26C and 31C. The forecast for the first week of the new year is looking good. The wind is as good as gone, there should be no rain and partially cloudy skies may allow some sunshine being poured over Koh Samui's beaches. Enjoy the start of the new year and a Happy New Year to all readers of this blog! Today the Boxing Day Tsunami is now 13 years ago. By now, 13 years ago, the two big tsunami waves made their destructive paths through many parts of Thailand's West coast. I still clearly remember how I was watching tv with a light hangover and the first news came on that an earthquake was felt in Phuket and that maybe one person had died. Boxing Day Tsunami is now 13 years ago; The Phuket Tsunami memorial at a park in Kamala, which I visited twice, earlier this year. How the news during that day would change. More and more devastating news slowly trickled through. A few hundred people dead was uttered within a few hours. Slowly the size and horror of what had happened started to settle in. It still took me two days to find out that Khao Lak was one of the hardest hit places in Thailand. Not having heard any news at all coming out of Khao Lak, my thought was that no news was good news. How wrong was I proven to be. The Kamala and Patong beaches were among the worst affected beaches on Phuket. An interesting read is this one by Mark Oberle, an American tourist during the Tsunami. Today many commemorative services are being held along Thailand's West coast. A day to remember for people who were affected by this event. It wasn't until March 2005 when I visited Khao Lak for the first time and it still looked like a disaster area. Some pictures can be found under the tsunami label on this blog. It's Sunday morning, the long run is done and dusted and it's time for the Koh Samui, Thailand weekly weather update; 18th December –24th December, 2017. This is a great time of the year for running and cycling. The temperatures drop and the mornings are nice and cool, around 25 to 26C. As long as it stays dry! Koh Samui, Thailand weekly weather update; 18th December –24th December, 2017; Along Plai Laem beach, at the most Southern point, you can find this 'sala' which is used for local people as a place of worship. Statues of an elderly couple are placed within the 'sala'. Last week was surprisingly nice and sunny. There was a very strong wind blowing all week long, which seems to only have been completely dissolved by today. That wind was cold though! Many local Thai people were dressed up as if 'winter had come' to Koh Samui. The wind had so much strength that most or all daily boat trips were cancelled. So no diving and/or snorkel trips were going out. The ferries to Koh Phangan and Koh Tao were still going although the Lomprayah boats had to use Nathon as arrival and departure location. Temperatures ranged between 27 and 31C during last week. The predicted tropical storm went on a South bound route and hit Malaysia over this weekend. 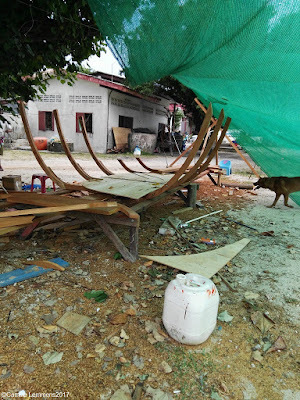 Koh Samui, Thailand weekly weather update; 18th December –24th December, 2017; A boat being build at the Plai Laem beach. Just in front of somebody's house it seems. The forecast for next week is not looking that good. Strong wind is expected come Tuesday accompanied by some rain. A fair wind is still expected on all other remaining days of the year with rain showers to go along with the wind. Stay safe and dry! See you next week again! This morning I participated in the 21st Kathu minimarathon on Phuket, which I did for the 3rd time, I also ran the 2010 and 2011 editions of this race. This morning it went well with a 4'35 pace over 10.25km. Race time was 46'58 and I managed to place 6th in my age group 55-59. That's a good result for me since there are always strong runners participating at Phuket races and today saw a a very big crowd taking part. A nice start of the Sunday. Koh Samui, Thailand weekly weather update; 11th December –17th December, 2017; Relaxing at the entrance gate to Big Buddha. Last week was perfect for this! Last week saw a lovely week with lots of sunshine and warm temperatures. Actually a bit unusual for this time of the year. Maximum temperatures ranged between 31C and 33C with only yesterday some rain and possibly later today. 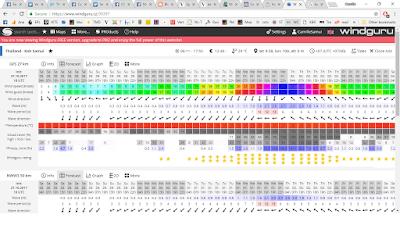 Koh Samui, Thailand weekly weather update; 11th December –17th December, 2017; Last week i was on Phuket all week long and on Wednesday evening we did a night dive from Kata beach. This is when we walked into the ocean. A lovely sight and view! The forecast for next week is not looking that great. The typical rain and wind is making a return visit and and strong wind with possibly each day some showers are expected. Especially next Friday and Saturday may see storm like condition, very strong wind and lots of rain. This years Christmas on Samui may not be white as expected but rather wet! Another Sunday morning, another half marathon done and time for the Koh Samui, Thailand weekly weather update; 4th December –10th December, 2017. It's almost 10am and we have a partially cloudy sky over Koh Samui, the sun is breaking through and it's going to be warm today! Current temp at 10am is 28.8C. Expect higher temperatures for the afternoon. On Phuket, where I started my last PADI IDC program of the year earlier last week, it's blue skies all around with an occasional cloud in it. Current temp at 10am is already 33C and rising! High season weather is finally arriving here, although there are almost daily evening or night showers. 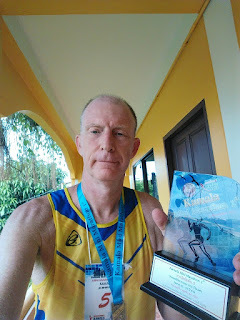 This morning I ran a half marathon as part of the Phuketon, a weekend chock full of running events. Out of 1959 participants I ended as 125th and I was 15th in my age group 50-59 out of 143 participants. I'm not in great shape with a 1:50 time and 5'09 pace but at the moment that's all I have! A very nice event though and well organized! 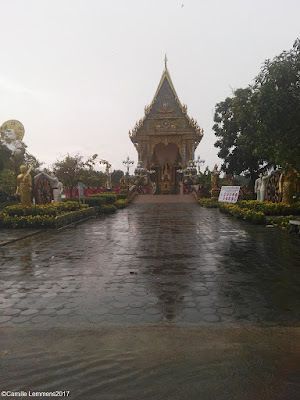 Last week saw plenty of rain again around Koh Samui with a few thunderstorms thrown as well. Friday was the only sunny day last week. The sun did occasionally break through towards the end of the week though. Maximum temperatures ranged 28C and 29C, nice and cool. A typical rainy season week with the occasional flash flood as well. Th forecast for next week is looking very good, blue skies and plenty of sunshine at least until Friday. 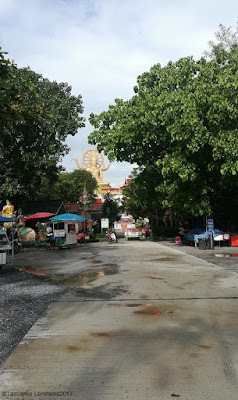 During there may be some rain coming Samui's way again. Enjoy the sun while it lasts, it's not your typical rainy season weather. It's Sunday morning and time to have a loom at the Koh Samui, Thailand weekly weather update; 27th November –3rd December, 2017. I find myself back in Surat Thani, where I participated in a half marathon earlier today, which did not go that well. After 15 weeks of training I was aiming at a finish time of close to one hour and forty minutes but after ended with a time of just under one hour and fifty minutes. After 4 km a hamstring started to play up and I needed to slow down. Not too happy with the final result and the race over all but there's always a next time. Came in 'only' 11th in my age group out of 73 and 41st in gender out of 475 and 49th out 650 over all. Koh Samui, Thailand weekly weather update; 27th November –3rd December, 2017; The new place for families to gather at temple events events at Wat Plai Laem. Almost completed now. Next week the forecast predicts plenty of rain and strong wind until Thursday, which is fairly typical for this time of the year. After that it should ease down and the sun may pop out again for a bit. Enjoy your stay on Samui nonetheless if you find yourself on our island! It's the first day of the last month of this year and time to say Welcome to December 2017. On this first day of December we have left yesterday's storm behind us and surprise, surprise, the sun is out and about! Just like the picture below, except with possibly even less clouds! Current temperature at around 11am is 30.2C and rising. This is not the weather to expect for the rest of this month though. December is usually a rather wet month, especially until around the middle of the month. The second may see improvements but that's not a guarantee. Last year saw an extremely bad sample of rainy season during December. In general it will be fairly wet though and the first week of this month is not an exception, according to the forecasts. Good amounts of rain can be expected until Thursday this week. Welcome to December 2017; The road near Samui Hot Club in Lipa Noi. This is the weather we are having today, but most likely this will not be the weather for the rest of this month! Stay tuned for updates of this December month and when you're on the island, I do hope you enjoy your stay, despite the possible rain. It's the last day of the month and time to say Goodbye to November 2017. Today is actually at the tail end of a storm coming over Koh Samui and all day so far it has been raining with a thunderstorm just having passed us. It has been raining all day long, sometimes harder and sometimes just a little bit. Flash floods have occurred at all the usual hot spots but will recede quickly, providing the rain stops or slows down. Current temp at noon is 24.8C. Goodbye to November 2017; The flash flood is receding in front of Wat Plai Laem and will be gone soon, providing it stops raining. This month was truly a rainy season month, with no rain during only five days this month! Every other day had rain in various degrees and amounts. Plenty of days there were flash floods around the island, but they disappeared almost as quickly as they popped up. The hard rain never lasted long enough to cause serious problems. Maximum temperatures ranged from 28C to 32C. The start of the last month of this year is not far away, just a few hours before December 2017 kicks off and we can only hope it will not be a repeat of last years weather. The forecast for next week looks ok-ish, considering this time of the year, in the middle of the rainy season. Rain can be expected but nothing too serious. Around the 6th December another storm might us again, so let's see and wait to see what happens. Early Sunday morning calls for the Koh Samui, Thailand weekly weather update; 20th November –26th November, 2017 . It's just before 8am and it's cloudy and windy around Koh Samui with a current temperature of 27.5C, but still dry at the moment. Most likely there will be some rain later during the day. It's my last day at Panagsama beach near Moalboal in the Philippines and it's partially cloudy with a current temperature of 26C at 9am local time. Later this morning I will move over to Cebu City, stay there all day tomorrow and fly back to Koh Samui, via Manila and Bangkok on Tuesday. 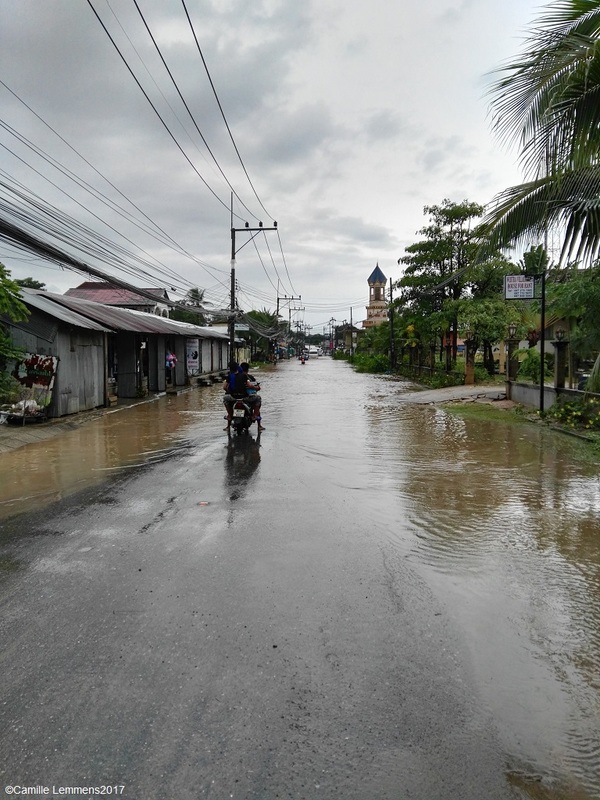 Last week saw rain during each day around Koh Samui but no non stop rain or serious flooding occurred. Max temperatures ranged between 30C and 32C. Koh Samui, Thailand weekly weather update; 20th November –26th November, 2017; Things to see and visit around and in Moalboal, Philippines. The forecast for next week shows more of the same, similar to last week, maybe with a bit more rain and a real nice thunderstorm towards the end of the week. The rainy season is here to stay for the next foreseeable time! 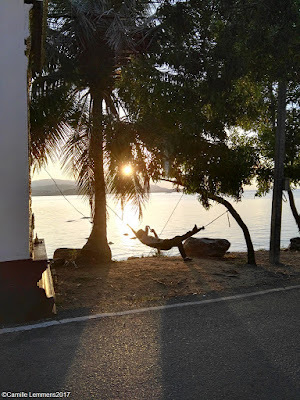 It's Sunday morning, around 8.15am Samui time and there are scattered clouds above Koh Samui with a very bleak sun coming through and it's time for the Koh Samui, Thailand weekly weather update; 13th November –19th November, 2017. I'm still in the Philippines, at Panagsama beach near Moalboal on Cebu island to be precise. It's partially cloudy here with the sun out and about and a current temp at 9.20am local time of 28C. Koh Samui, Thailand weekly weather update; 13th November –19th November, 2017; Hotel Ibis under construction in the middle of Chaweng, next to the Hard Rock cafe. Koh Samui, Thailand weekly weather update; 13th November –19th November, 2017; View from my breakfast table at the Lantaw restaurant in Panagsama beach near Moalboal in the Philippines. The forecast for next week is also very typical for this time of the year, each day is most likely going to see some rain and occasionally a thunderstorm may pass over. Be prepared for some occasional flash floods but they should not hold on for too long. All in all nothing out of the ordinary for this time of the year. It's late in the evening after a hard day's work but here is at last the Koh Samui, Thailand weekly weather update; 6th November –12th November, 2017. I find myself back at Panagsama Beach in Moalboal on Cebu island in the Philippines, where I started my 150th PADI IDC program today. A nice jubilee! Last week saw some pretty standard rainy season weather around Koh Samui. Only Friday saw a complete dry day and a nice visit from the sun as well, although it was mostly partially cloudy. All other days saw from partially cloudy to cloudy days and there were a few rain showers, occasionally causing some floods. Especially the beginning of the week was hard, when Samui was sitting at the outskirts of a storm. Lots of rain and flash flood galore for a day or two before things went back to better conditions. Sometimes the sun was out but there were showers as well. From a tropical shower to a few times hard rain for an hour or so, but that was mainly during the night. Koh Samui, Thailand weekly weather update; 6th November –12th November, 2017; View from the Lantaw restaurant at Panagsama beach in Moalboal, on Cebu island in the Philippines. This picture was take 3 years ago in may, different season and the sun was out. I just arrived yesterday and have been busy ever since, so didn't have time to take some pictures yet. The forecast for next week is fairly standard rainy season weather with some rain predicted on most days. Tonight might see some hard rain in the morning but come next weekend, we may also see some sunshine again. Typical for this time of the year though, so enjoy all the sun that you can get! It's Sunday morning, once more and time for the Koh Samui, Thailand weekly weather update; 30th October – 5th November, 2017. It's been a busy week and I've spent most of it in Khao Lak, with the PADI IDC finishing, the PADI IE being completes and PADI Instructor specialty diving done and dusted. Yesterday I arrived in Kamala, Phuket where I participated in the 1st Kamala mini marathon this morning an placed 5th in my age group. First things first though and that's the current Sunday morning weather on Koh Samui. It's mostly cloudy with a current temp of 27.9C at 10am and a very strong wind blowing. Don't be surprised if later today there may a tropical shower or two. Fairly typical for this time of the year! 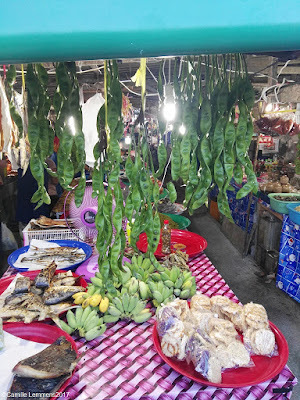 Koh Samui, Thailand weekly weather update; 30th October – 5th November, 2017; The Plai Laem market, earlier last month. The green veggies on a string are sator, a Southern Thai veggie which I like a lot. Last week saw plenty of clouds and a bit of wind, except for the night of 2nd to 3rd November when it rained all night long and the usual hot spots on Koh Samui had some flash flooding for a couple of hours, especially between 7am and 8am. Before noon the rain stopped though and the floods disappeared rather quickly. A fairly standard procedure this time of the year. As long as the rain doesn't last for more than a week, flash floods come and go quickly since the drainage systems aren't saturated. Max temperatures during last week ranged from the usual 32-33C to 28C on the 2nd and 3rd. Koh Samui, Thailand weekly weather update; 30th October – 5th November, 2017; Police patrol boat 813 in Khao Lak is still in the same spot as the Tsunami deposited it. More and more construction is going on around the monument. The forecast for next week shows and predicts strong wind and plenty of rain on Monday to Tuesday night with a build up and phase out before and after. From Wednesday onward the wind settles in again although the occasional tropical showers will continue. As already mentioned, nothing unusual for this time of the year. Koh Samui, Thailand weekly weather update; 30th October – 5th November, 2017; After the 1st mini marathon in Kamala on Phuket, where I ran into 5th spot in my age group. 9.5km in 46'40 or a 4'54 pace. One of the hilliest race routes a ever ran so far and to top it off, the finish was a 1km stretch on the beach. All for the price of one with no extra charge! Happy with my result, since Phuket always has some strong runner at the start line! So, here we are, November has started and luckily the very strong storm that was predicted for the 2nd and 3rd November didn't happen, it all fizzled out in the end. Luckily enough. The rainy season has roared it's head though and do expect plenty of showers during this month with the occasional flood here and there. Hopefully scenes from last will stay away from us on our beloved island! It's the first day of this new month and here we go; Welcome to November 2017. November is when the monsoon starts and it can get very wet around the island, with all associated issues that come along with this, like floods and power cuts, just to name a few. Last year saw a nice November, with plenty of sun but also enough rain but the year before, 2015, saw almost non stop rain. The forecast is not looking too good for the first week with some strong winds coming in over the next couple of days and plenty of rain. Welcome to November 2017; Samui hot club, a clothes shop now located in the South of the island in Lipa Noi but it used to be smack down in the middle of Chaweng. Now it's about 10 minutes outside of Nathon if you drive direction Lamai. We will also see Loy Kratong on Friday 3rd November, the very popular festivity around Thailand where you put a float in water. On Koh Samui typically at Wat Plai Laem or Chaweng lake. It will be my third year in total that I will celebrate this in Khao Lak. Welcome to November 2017; The harbor in Thap Lamu where all the day trips and live aboard boats to the Similan islands, Koh Tachai, Koh Bon, Richelieu Rock and the Burma banks leave. The pier offers more space to bigger boats than is just shown on the picture. 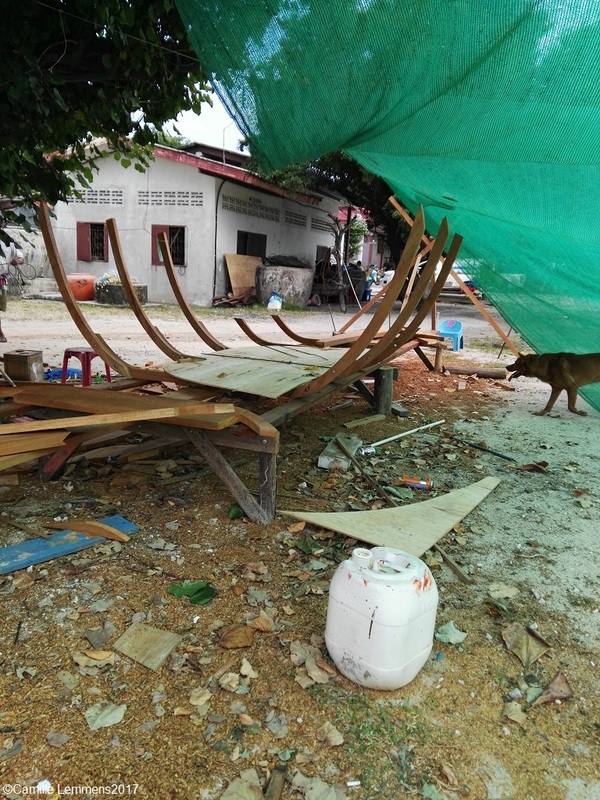 Local fisherman also use this and other piers and the Thai Navy has their own pier just a few hundred meters away. The first week of this month I will spend in Khao Lak and a day on Phuket and two weeks will be spend in Moalboal in the Philippines, which leaves little time at home. The weekly updates and any other interesting island developments or events will be resported about, as always. It's the 31st of October in the year 2017, late evening, just two more hours to go in this month and it's time to say Goodbye to October 2017. Today was a busy day with an early rise since I was visiting the Similan islands for some deep diving PADI Instructor courses with one of my candidates of the current PADI IDC here in Khao Lak. Up early and back to my room late with lots of work waiting for me so the blog update got pushed back a bit. Nonetheless, here we are, with an update on the weather for this version of October 2017. In my opinion it was an average October. Plenty of sunny moments, especially during the mornings, but also plenty of partially to cloudy skies and a fair amount of tropical showers with some thunderstorms thrown in for good measure. A fair mix of different weather conditions for a tropical island like Koh Samui. What else to expect in October, pretty much weather like I just described. The monsoon is lurking in the shadows though and the beginning of next month may be very wet! Looking forward to what November will bring next month. Stay tuned to this blog channel for steady updates. Yesterday was Sunday and time for the Koh Samui, Thailand weekly weather update; 23rd October – 29th October, 2017. Today is already Monday, late in the evening and finally I found time to update the blog with last weeks weather report! At almost 10pm it's dark now and 27.5C and today saw plenty of sunshine in a partially cloudy sky. Koh Samui, Thailand weekly weather update; 23rd October – 29th October, 2017; Inside Wat Plai Laem last week, during the late King Bhumibol Adulyadej's cremation ceremony. 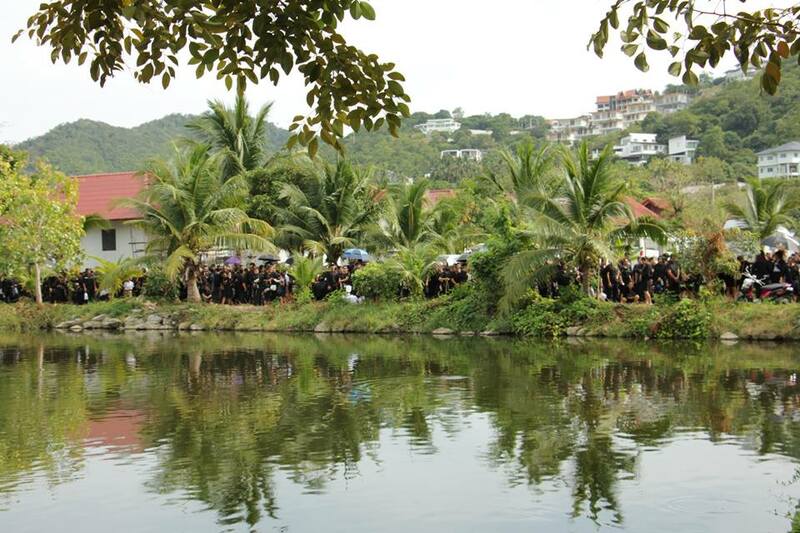 Paying respect by the local Samui people and residents. It was very busy and waiting time for up to eight hours was no exception. Last week was fairly good for this time of the year, with three days being partially cloudy but with sunshine and four days with tropical showers. Maximum temperatures ranged between 32 and 33C, so very steady, despite some showers. Koh Samui, Thailand weekly weather update; 23rd October – 29th October, 2017; In Thap Lamu, near Khao Lak, one of the Royal Thai Navy ships of the navy bass in Thap Lamu, went out to the ocean the day after the latte King's cremation to offer the burned sandalwood, offered by the local people, into the ocean. All around the country you had the opportunity to offer sandalwood in honor to the late King Bhumibol Adulyadej. 19 million people apparently did! The sandal wood was burned and all around the country this sandal wood was then a day later offered to a body of water. Near Khao Lak that was the ocean. We saw the ship just come back into port after it had completed this honorable task. With the current PADI IDC in Khao Lak we had our day of open water training dives on the same day. The forecast for next week was very interesting. At some stage, Saturday 28th October, it looked like a massive storm would hit Koh Samui on the Thursday 2nd November. That same day, the forecasts showed that the storm would pass north of Samui. Only to drop down again a day later when Samui was threatened again. Today it looks like the power behind the storm has fizzled out and we will be spared from seriously heavy storms with accompanying rain and wind, which would have caused floods, power cuts and the likes! The forecast are still predicting lots of rain from Wednesday through Friday and a flood or two may or will occur but it's not nearly as bad as it was originally predicted. The monsoon is knocking at the door though and it looks like the start of November will be very wet! There is a Typhoon heading towards Koh Samui on 2nd November. All weather forecast programs predict a typhoon strong storm to hit the Gulf of Thailand over the next couple of days, on it's way to Chumpon. On the night of Wednesday to Thursday, the typhoon is supposed to hit Koh Samui, providing all forecasts are correct. It's another four days to go but it's better to be safe than sorry. We can only hope that this typhoon is not going to be as bad as it is predicted. There's a graphic link to be found here, have a look and keep following that link over the next couple of days to see how things progress. The current airflow down from the north west may get funneled and amplified into the Gulf of Thailand and might get mixed up with the yearly north-east monsoon, the monsoon that's about to start any moment. Wind predictions of 90 miles per hour wind are currently predicted with over 300mm of rain in a day. That's more than the 110mm we had last year with the known results of serious flooding. Current predictions have the typhoon hit Koh Samui during the night of Wednesday 1st November to Thursday 2nd November at 1am. The fact that there will be real high tide twice a day, on 2nd November at 0833 and 2056 with 3.62m and 3.91m will make it even more difficult for water to flow away. This is something to keep an eye out on and slowly start to take precautions. This reminds of 1989 and Typhoon Gay, also known as the Kavali Cyclone of 1989, which was a small but powerful tropical cyclone that caused more than 800 fatalities in and around the Gulf of Thailand in November 1989. To date the worst typhoon to affect the Malay Peninsula in 35 years, Gay originated from a monsoon trough over the Gulf of Thailand in early-November. Owing to favorable atmospheric conditions, the storm rapidly intensified, attaining winds of more than 120 km/h (75 mph) by 3 November. 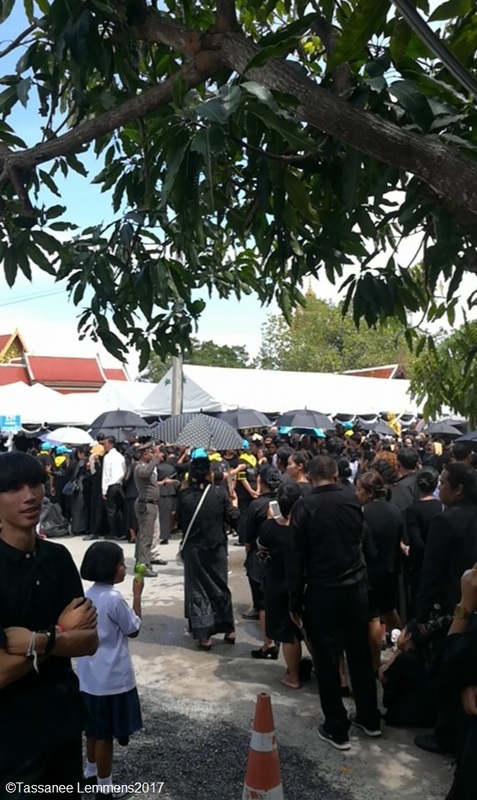 Yesterday the Cremation ceremony of H.M. the late King Bhumibol Adulyedej on Koh Samui was held at Wat Plai Laem. 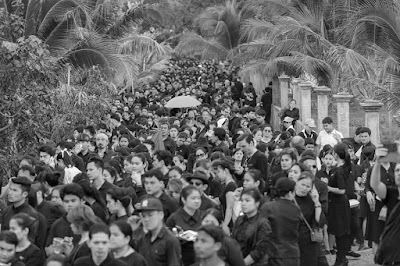 People from all over the island came up to Wat Plai Laem throughout the day to pay their respects. Many mini buses and taxi's offered their services for free to bring mourners to or from the temple. 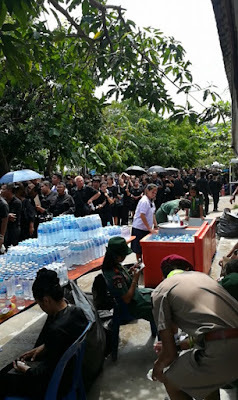 At many places around the island and near the temple, small shops and fruit sellers offered water and food for free to mourners. Mywife and our kids went to the temple during the morning hours but still had to wait for eight hours before they could eventually pay their respects, All parking psaces around the temple filled up quickly! 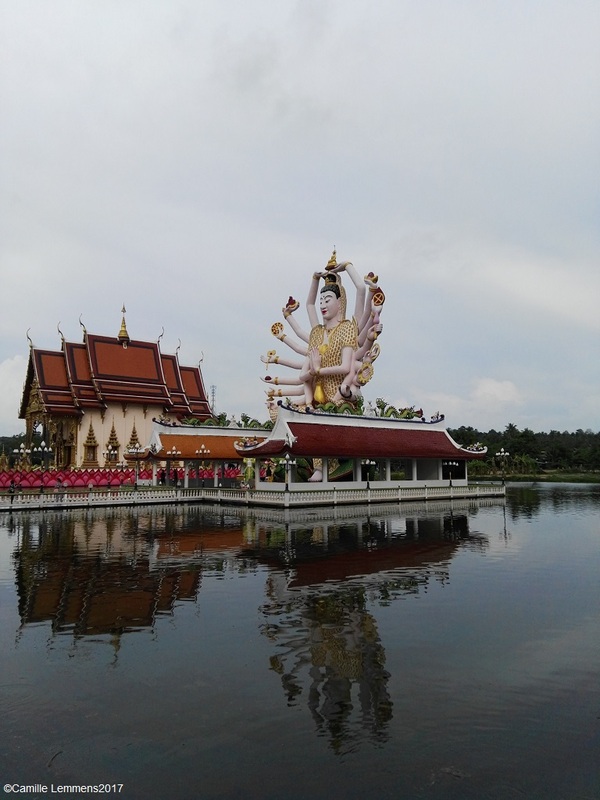 In Bangkok the main ceremony was televised live all day long. An impressive ceremony could be followed on TV or Youtube. The ending was somehow confusing though when the anticpated actual cremation at 10pm wasn't televised. 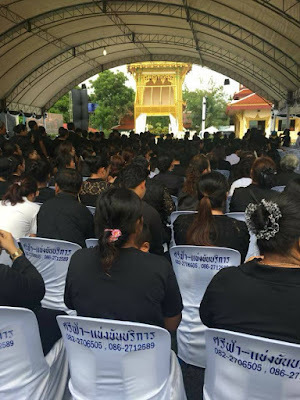 It turned out that the late King didn't want the actual cremation to be televised and to be a private event. At last, around 11.30pm, smoke could be seen emerging from the ceremonial gound in Sanam Luang. 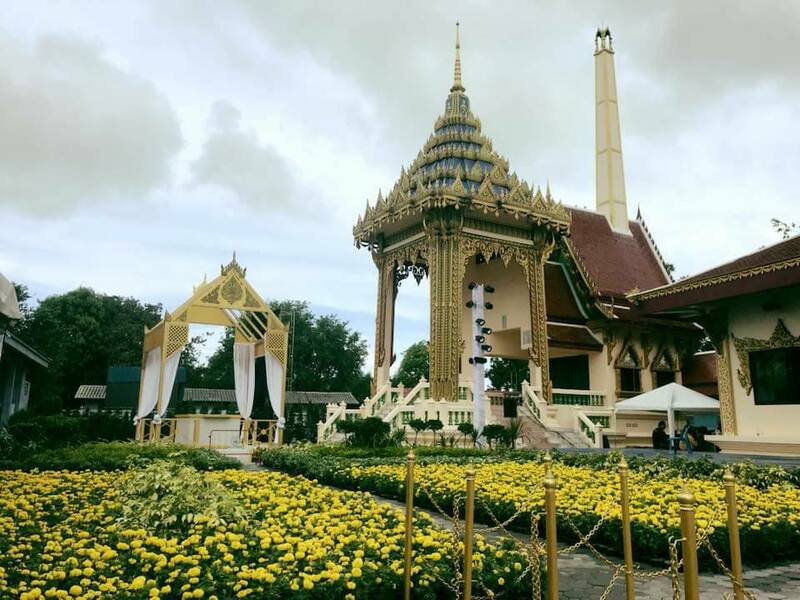 This morning, 27th October, right now, the ceremony for the Royal Relics of H.M. the late King Bhumibol Adulyadej is being held, during which the ashes will be collected and be brought over to the Grand Place. 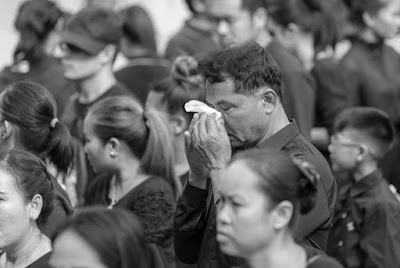 Now within a few days, all signs of mourning will need to be taken down arouind Thailand and Koh Samui and the country will move on into a new area. 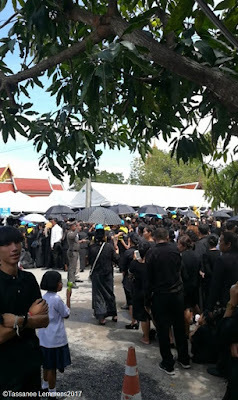 Cremation ceremony of H.M. the late King Bhumibol Adulyedej on Koh Samui; Obtained a seat! It was an impressive event and a 'once in a life time' event as well. Many Thai people only knew one King and he was revered all through the country. Hope you had a cance to follow the events yesterday, in person or on tv or Youtube. Now it's time to move and look forward. A year of mourning has come almost to an end. At last here's the Koh Samui, Thailand weekly weather update; 16th October – 22nd October, 2017. It has been a long and busy day for me today, hence my update is only being written right now, almost at the end of the day, just after 10pm. We're nearing the end of October but the weather is still holding out fairly nicely. Since four days I find myself back in Khao Lak, where I am conducting a PADI IDC in conjunction with PADI 5* IDC Center 'Sea Dragon'. The forecast for next week is a fair bit of breeze tomorrow and a small possibility of a tropical shower each day. Once we hit next week Friday and the weekend, we may see some more rain coming our way. Still, pretty good for an October! On 26th October around the country and including Koh Samui will be respecting the Royal Cremation Ceremony of His Majesty the Late King Bhumibol Adulyedej. 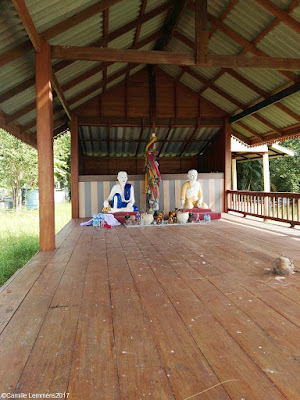 The accompanying ceremony on Koh Samui will beheld at Wat Plai Laem on 26th October and will start at 9am. If you like to attend, please do check the dress explained below. 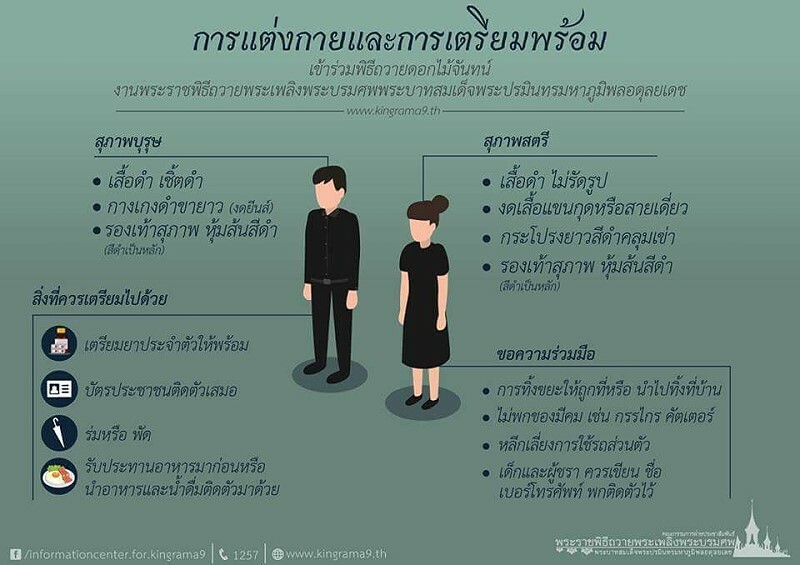 This dress code was released by the Bureau of the Royal Household for people participating in the Royal Cremation ceremony on 26th October 2017. The dress code is also applicable to people who are going to place funeral wood flowers at royal crematorium replicas, and at other locations where they will be able to offer the wood flowers in Bangkok and other provinces. This will include Wat Plai Laem or any other official location around Koh Samui in case you plan to pay your respect. At this moment it looks like the whole nation will come to a grinding halt on 26th October, please act accordingly and show respect to the Thai people. This is a one in a lifetime event, not only for the Thai nation and it's people, but also for anybody visiting or living in Thailand at that moment. Act accordingly. 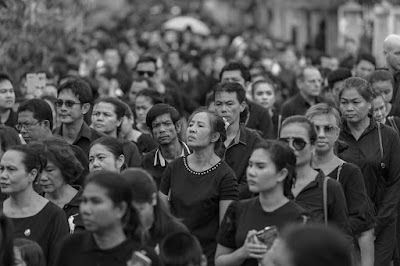 During the whole month of October, many Thai people will be wearing black or dark colored clothes as a tribute and to show respect for the Late King Bhumibol Adulyedej. On most days tourists are not expected to wear dark clothes but on the 26th October it is advisable to wear black or dark clothes and nothing too vibrant. Most tourist attractions will be closed and the days surrounding the 26th October, most entertainment venues will have toned and tuned down their activities. 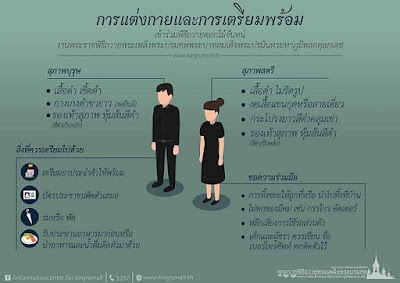 Koh Samui will be respecting the Royal Cremation Ceremony of His Majesty the Late King Bhumibol Adulyedej; The expected dress code if you plan to attend a ceremony; Men must wear a black shirt, long black pants and black dress shoes. Denim pants will not be allowed. Women must wear a black blouse that is not tight, a black skirt that extends below the knees and black dress shoes. Wearing a sleeveless blouse or a spaghetti top or similar will not be allowed. 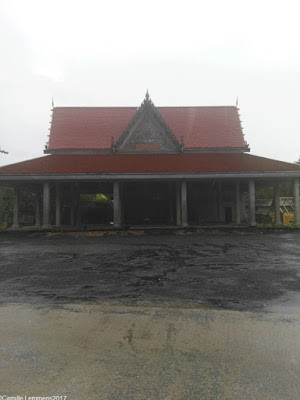 At this moment, on the evening of 29th October, all signs of mourning, including black & white cloth banners and black and white portraits of King Buhimbol should be removed. On 30th October, government officials and members of the public can wear normal attire again.